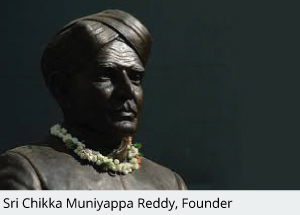 The CMR Jnanadhara Trust was established in 1990, as a tribute to the late Sri Chikka Muniyappa Reddy, a visionary educationalist and philanthropist who believed that every individual deserves access to a quality education. In accordance with his vision, the CMR educational institutes were founded to give every student a chance at an outstanding, value-based and well-rounded education. The CMR Jnanadhara Trust supports and manages all the activities of the CMR Group of Institutions. The CMR Group is a unique educational conglomerate consisting of K-12 schools, a number of institutions of Higher Education, a Pre-University College, various Centres of Excellence in Research, and a Private University. 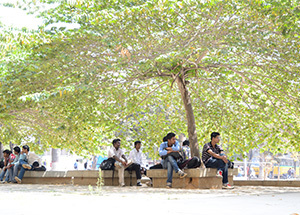 These educational institutions are located at eleven different campuses across the city of Bangalore, India. CMR has also partnered with the National Education Trust to found the NPS International School on a lush 6-acre campus in Singapore. The Group caters to over 18000 students from 58+ countries. Academic programmes are varied and cover more than 50 areas of study including engineering, education, law, management, biosciences, business administration, and psychology at the undergraduate, postgraduate, and doctoral levels. These institutions were established to promote academic and professional excellence in their respective fields. CMRU believes that creativity is the key competence required to excel in the complex world where independent thinkers, product leaders, artists, designers and innovators are the need of the hour. The students learn creative concepts and design thinking regardless of their area of study. Students are evaluated on the basis of real life skills such as teamwork, presentation, research and initiative. CMR University fosters creative communities where new ideas can be nurtured, new discoveries made and new creations shared. The CMR logo is rooted in Indian tradition, yet rendered in the contemporary form of the Hamsa, the Swan. The swan is the carrier of Goddess Saraswathi – the Goddess of Learning. It is said that the Swan, with its sensitive beak, has the power of discrimination – an ability to distinguish pure milk from a mixture of milk and water. The wings of the Swan rendered in the alternating flowing lines of blue and white represent the metaphor of milk and water. The blue stands for clarity of purpose and the white for purity of vision. The overall form of the logo radiates and sparkles in the calm, self-contained posture of the Swan gliding on water.